Economics affects all parts of our daily lives. So, if you want to be an informed citizen you have to know at least some of the most basic economic concepts. This will help you understand how the world works and enable you to take well-informed decisions. 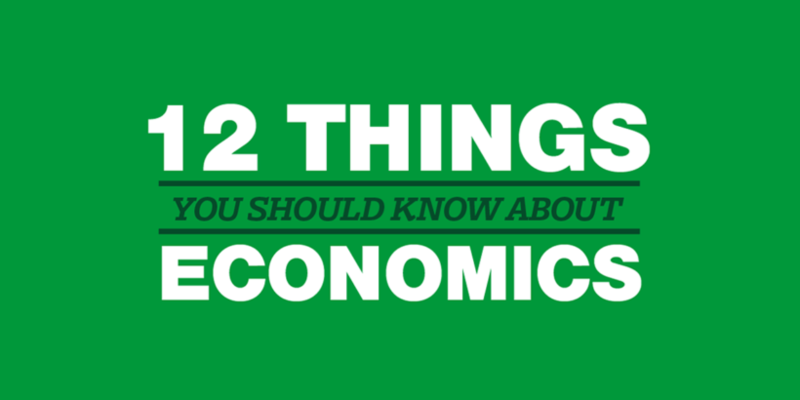 Now, because we know that not everyone has the opportunity or desire to become an econ major, we have created an infographic that illustrates 12 things you should know about economics. It’s kind of like a cheat sheet for Econ 101. Have a look. Macroeconomics is the study of the economy as a whole. It focuses on aggregate numbers and data for entire countries. Thus, it provides a broad perspective. Microeconomics on the other hand is the study of small economic units. It scrutinizes individuals and their decision making from a close perspective. Even though the two branches cover different areas of economics for the most part, they are highly interrelated. People constantly face trade-offs. They have to make choices due to scarce resources. As a result, they can’t get everything they want, so they have to pick certain things over others. Opportunity costs describe the value of the next best alternatives that are given up during this process in order to get something else. The price of a good or service is determined by its supply and demand. 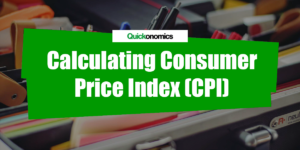 In most cases an increase in demand results in an increase in price, given that all other factors remain unchanged. Meanwhile an increase in supply, all else equal, results in a decrease in price. In the long run, the market reaches an equilibrium price where supply equals demand. If an economic actor has the ability to produce a good or service at lower opportunity costs than another actor, they are said to have a comparative advantage. In the presence of comparative advantage, all actors can benefit from cooperation and trade if they specialize in producing and exporting the goods and services they can produce more efficiently than others. In most cases, the satisfaction people get from consuming a certain good or service decreases as its supply increases. At some point, the marginal utility of consuming an additional unit may even become negative (i.e. completely unfavorable). This concept is often used by companies to set prices. Economic growth is necessary to satisfy people’s desire for an ever increasing standard of living, to redistribute wealth, and to advance new technologies. 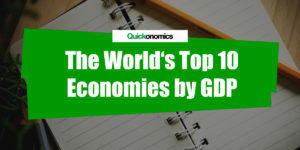 It is measured by the change in GDP, the total value of all final goods and services produced within an economy over a set period of time. Externalities are the positive or negative consequences of economic activities experienced by unrelated third parties. They can arise either on the production or on the consumption side. In most cases, externalities result in market failure that can only be avoided by imposing some kind of regulation to internalize them. Most economies experience a moderate level of inflation. That means, the overall price level increases, which is equal to a decrease in the purchasing power of money. Deflation on the other hand is less common. It describes a decrease in the overall price level, i.e. an increase in the purchasing power of money. Whenever a bank loans money to someone, it will expect to receive interest in return. This way it can be compensated for its opportunity costs and the risk of not getting the money back. Interest rates define how much people (or institutions) have to pay to get a loan. Hence, they have a significant impact on all monetary transactions. 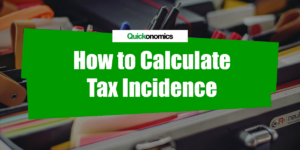 One way for the government to monitor and influence a country’s economy is by adjusting its spending and tax rates. The concept of fiscal policy states that increased government spending and lower tax rates will stimulate economic activity, whereas a decrease in government spending and higher tax rates will decelerate it. Thus fiscal policy can be used as a means to smooth economic fluctuations (i.e. booms and busts). Central banks or currency boards can influence a country’s economy by adjusting the supply of money. They do this by buying or selling government bonds or by modifying the interest rate. An expansionary monetary policy will boost economic activity and growth, whereas a contractionary policy will reduce it. Economies generally experience alternating periods of expansion and contraction in economic activity. A business cycle starts with a boom, followed by a recession. Once the trough is reached, the economy recovers and expands again until it reaches its next peak (i.e. starts its next business cycle). Thank you very much for the very good explanation! !